Please ring or email for any other information required. Friday to Monday (3 nights) available for £170 low season and £230 high season, Monday to Friday (4 nights) £230 low season and £310 high season. Full 7 nights low season £330 and high season £500. Please note we do ask for a £75 fully refundable damages deposit to be paid also, this will be refunded straight back to you once caravan checked after your vacation. Our caravan is a gorgeous 3 bedroom 40 ' long Abi Eastwood caravan which has fitted a fabulous 8' patio area which then runs into a full length veranda, which shuts with a secure gate. Patio has new rattan furniture and tables so you can enjoy the fantastic sea views even more. Whole patio and veranda have solar powered lights and patio has 4 spot lights as well so you can sit out until your hearts content! 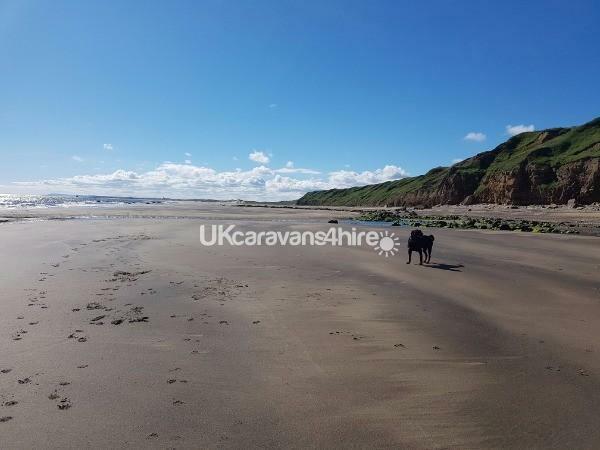 The caravan has everything you need for a holiday in style and comfort, this is a platinum grade caravan which is on a premium pitch with excellent sea views and access to the beach within 50 metres. 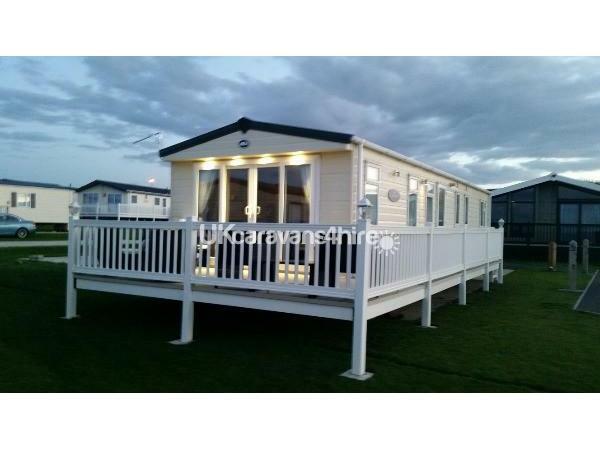 Our lovely caravan is very spacious and has 3 bedrooms and we're situated on Crimdon Dene Caravan Park. Central heating means its cozy and warm in the colder months and your not worried about changing the gas bottle. Clothes space in each bedroom, free standing furniture in the lounge with freeview TV, DVD player. Gorgeous sea view from front and all one side of caravan. Beside a large field which leads straight to steps to the beach (these steps are steep) or pathway leads to easier access to beach. Master bedroom with en suite toilet, two bedrooms each with two single beds, bathroom with double shower, seperate toilet. Seperate kitchen and lounge, kitchen equipped with seperate oven and grill, extractor fan, large seperate intergrated fridge and freezer (with plenty of space), dishwasher, combi microwave and plenty of cupboard space. Lounge has two seater sofa, two armchairs and a large bean bag. The two seater does make into a fold out bed if required. Ample parking and space to play and lots of dog walks straight from the caravan. Caravan stocked with bedding and towels. Excellent pub and restaurant on site, this has recently been refurbished and provides a good menu. Pool with jacuzzi, tennis and sports court, kids club, amusements and lots of other entertainments. Easy access straight into Hartlepool 10 minutes drive or plenty of other areas to visit, Durham is only 30 minutes away. We would ask please if you are bringing a dog they must not be allowed onto the furniture or beds, thank you. Should you wish to purchase a facilities & entertainment pass for the park this can be done direct with reception. Please note in the quieter months the facilities are still open but only on certain days. Also now available is Wifi, details will be supplied if required. If you would like to book a vacation please contact us, full payment required 21 days prior to arrival please and 25% deposit required upon booking. Plus we do ask for a £75 fully refundable 'damages' deposit please which is returned after an exit check carried out on the caravan. Our caravan is available all year round and please note 'high season' for our caravan is 1st April to 30th September. We fancied a relaxing weekend away by the sea and also take the dog. This caravan was perfect, right for the beach ( where u can have a fire and bbq if u like that sort of thing) It is far enough away from the club house to be peaceful but also close enough for an easy walk to where it all happens. We will definitely be visiting again. Loved the caravan lay out. Perfect, homely and very spacious. Top draw. We have just returned from a fabulous weekend at this beautiful well equipped caravan. 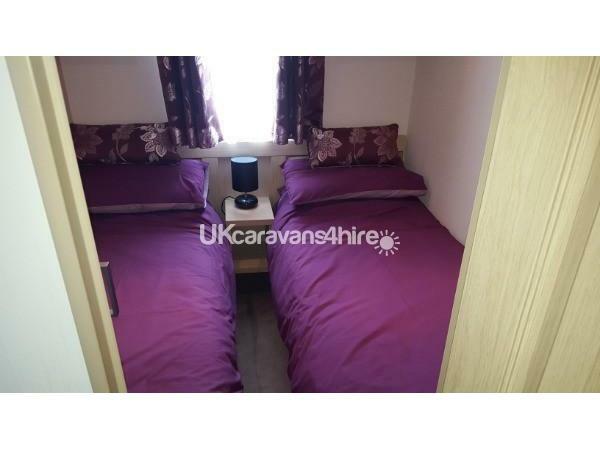 The position of the caravan is perfect as are the views, it has everything you need for a perfect stay. We can’t wait to return. We had a wonderful stay here to celebrate a special anniversary with our wee dog. Everything was included so there was no massive packing of towels and bedding. First class location and accommodation. This was actually my 5th time staying in this caravan and it never fails to disappoint. It is always immaculate and Dawn makes booking really easy. It is dog friendly and it’s just a short walk to get onto the beach (although the steps are steep !). It is a really quite spot on the park with a field out front so you get great views. Would highly recommend and I will be booking again soon. 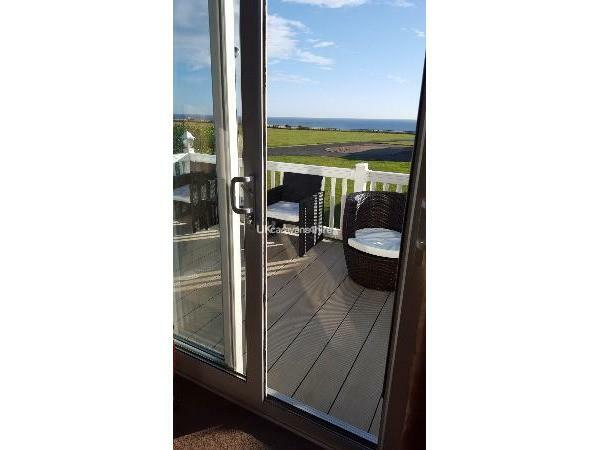 Lovely luxury caravan in a quiet location on site with a fantastic view. Everything was spotlessly clean and of high quality. It was a nice touch to include things like bedding, towels, toilet rolls, tea/coffee (great biscuits my son said), cleaning supplies etc. With all these extras it means all you need to bring is clothes and food/beer. Having a dedicated parking space was very useful and having proper paths means no mud which is sometimes a challenge at other sites. Also fantastic communication when booking and even returning the deposit which was fast. Thanks Dawn we had a great weekend away and we will definitely be back. 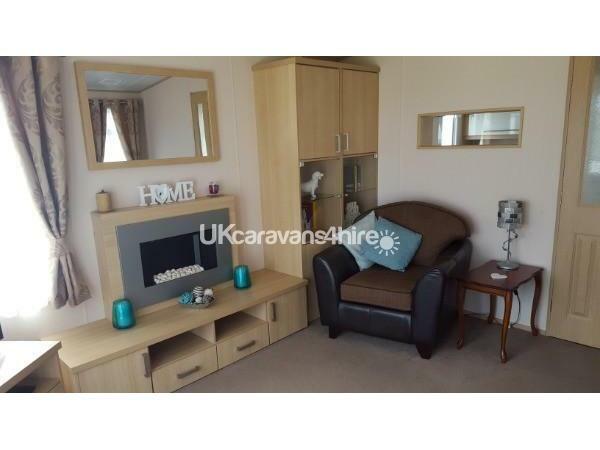 Lovely caravan with everything you need for a relaxing break. A couple of our nights were during high winds and heavy rain but the caravan is very solid and stood up well to this unlike previous caravan experiences we've had. Felt much more like a bungalow than a caravan and all the welcoming extras left by owner were very much appreciated. The booking was very smooth from beginning to end with a fast pleasant exchange of e-mails. Highly recommended. Will be in touch for next trip when due. Thank you. Fantastic to hear you enjoyed your stay (despite the weather) and thanks for the great review ???? We have had an amazing week in this fabulous holiday home. There was plenty of room for the six of us. The separate living room and kitchen make it feel very spacious. Everywhere in the caravan was very clean, bedding and towels were beautiful and of a high quality. Having the veranda meant our toddler could play out safely and it was great to sit on both in the day and in the evening. The positioning of the caravan is fantastic. Although not on the front row of caravans there is a gorgeous sea view and wide open space so we weren't overlooked at all. The site in itself had good amenities but I would recommend thinking hard about buying leisure passes. We bought them then discovered we had plenty to do without needing them. In all I can't recommend this holiday home enough and would not hesitate to book again. The owners take great pride in their property and also looking after their guests. They are great to communicate with and have been extremely helpful throughout our stay. Thank you so much and I'm sure we'll be back soon!!!! Family holiday - great caravan lovely beach just one rainy day. Clubhouse not the biggest but suited our needs. Beautiful home from home. very comfortable & immaculately clean. Everything and even more included that you could possibly need . (only thing missing was an ironing board, not that we needed one) The veranda and its furniture are definitely a plus with its beautiful views that can be taken in from its lovely location. It was so lovely didnt want to leave and when we return, out of all the caravans on the site, this would be the one i'd want to stay in again. The owners are a pleasure to deal with responding quickly to everything. They deserve to be proud of their little home from home. 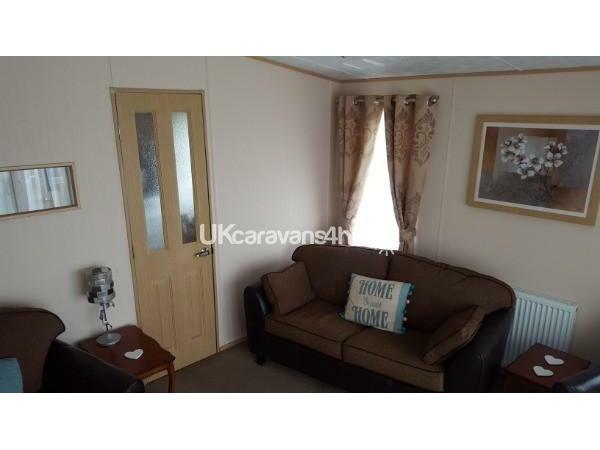 This is the perfect spot and a really lovely caravan with pretty much everything you could want. It's comfy, warm, clean and has proper furniture, plenty of books and homely touches, and if the weather allows, it has a great veranda to sit and relax and enjoy the fabulous view. It is at the edge of the site, so you don't feel penned-in by other caravans. Could not have been happier with our stay and look forward to another visit! Very enjoyable stay. Caravan was great with everything there that you could need including all the basics that you normally have to take. Lovely big fluffy towels. Very clean. Complete fenced in around the decking so great for our dog also. Dawn made booking the van simple and paid deposit back promptly after our stay. Definitely will book again. Great stay! 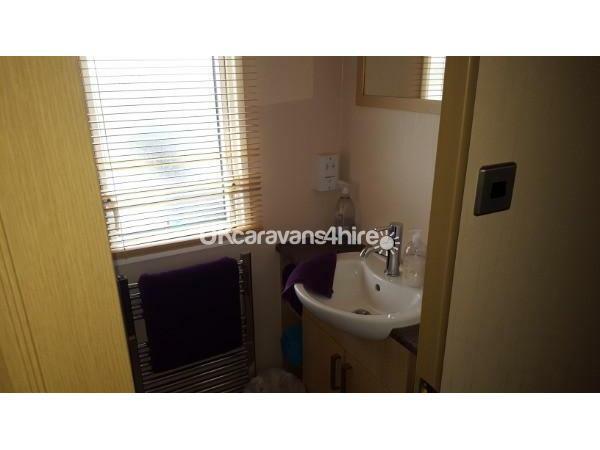 The caravan was spotless and had everything you could ever need and more. Some lovely extra touches such as games, and dvds etc to watch. Amazing view and we were lucky enough to have some sunshine. I would definitely recommend to others and will hopefully get to book a return booking! Dawn was very helpful throughout making the booking easy and a smooth process! Thanks again for a great stay. REALLY ENJOYED OUR TOO BRIEF STAY AT THIS TOTALLY IDEAL HOLIDAY CARAVAN. IN A SUPERB SPOT ON THE PARK. PEACEFUL WITH LOVELY VIEWS OF THE SEA FROM THE LOUNGE AND ALONG THE DISTANT SHORE LINE. VERY CLEAN AND COMFORTABLE ACOMMODATION WITH EVERY POSSIBLE CONVENIENCE. EASY TO ACCESS THIS SITE. FRIENDLY AND HELPFUL PARK STAFF AND LOVELY OWNERS. EASY, UNCOMPLICATED BOOKING ARRANGEMENTS. JUST WHAT WE NEEDED, WILL BOOK FOR LONGER NEXT TIME. THANKS DAWN. Stayed in this beautiful caravan before for a short break and kids loved it,so this time we booked for the week. Absolutely beautiful, warm,clean caravan and stunning scenery. Everything you could possibly need for a family holiday, real home from home.The owners are fantastic very friendly and helpful. I would highly recommend this caravan. Could not fault this caravan at all. Lovely, clean, comfortable and situated in the perfect spot. Everything was there for you - like home from home. Bedding and towels were clean and fresh. Communication with Dawn the owner was excellent and we look forward to our next stay in this caravan. Absolutely lovely caravan which is actually more like a bungalow! 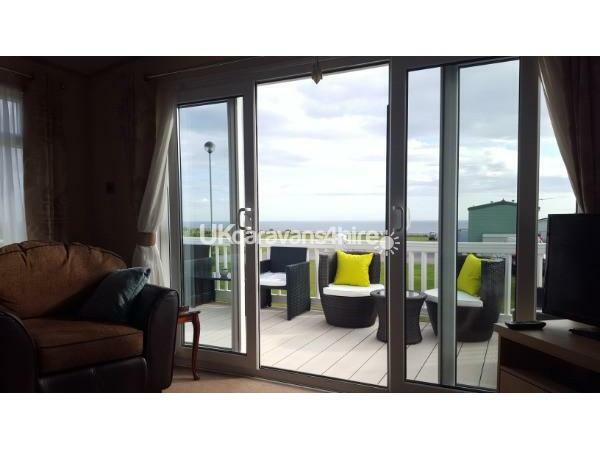 It is beautifully sited with great views of the sea. Everything was very clean and it is extremely well equipped. Out grandchildren really appreciated the children's games. We definitely need to return in summer when we can make use of the beautiful new decking and patio furniture. Immaculate caravan quiet,stunning location,very well stocked by owners Dawn and Colin who where very easy to deal with.Very impressed,hoping to book again next year. 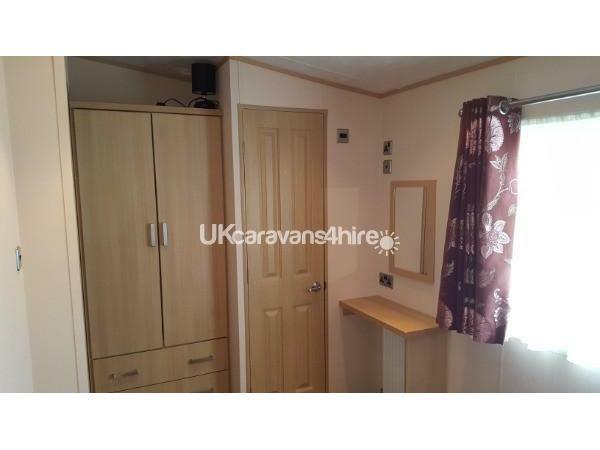 Absolutely stunning and immaculately clean caravan in a lovely location . The owner, Dawn, couldn't have been more helpful and we look forward to staying again next year. Would highly recommend. Caravan and view excellent. Caravan was immaculate with everything we needed (lovely new porch also). Owners were very attentive to ensuring we had an enjoyable break, communication was excellent and friendly. Highly recommend. 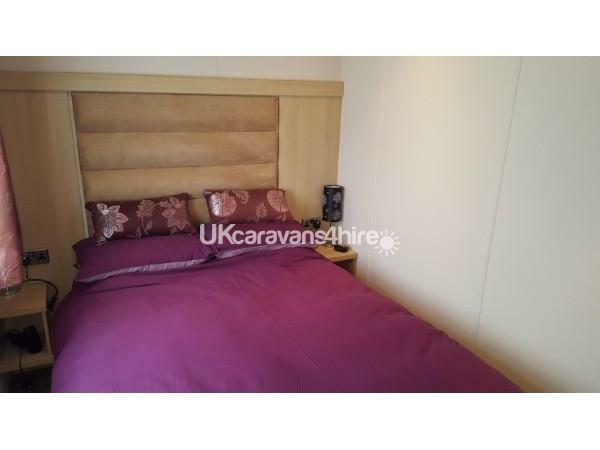 Beautiful, clean, comfortable caravan with stunning sea views. It has everything we could possibly need, owners very helpful and friendly. I would highly recommend this caravan to friends and family. I would certainly like to use this caravan again for a longer stay in future. My husband and children could not rave enough about this caravan, they had a lovely time and have even made a film for me to see how brilliant it was. Unfortunately I could not go at the last minute so totally missed out on a lovely break, but will definitely book again. Owner was lovely to deal with and we look forward to our next holiday together in this caravan. Thank you. Extremely happy with our 3 night stay. 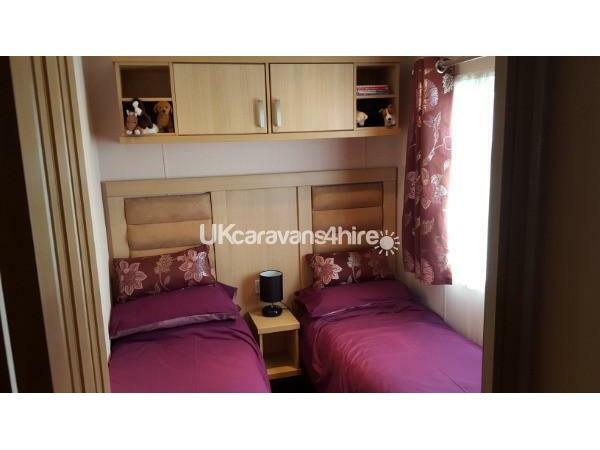 Caravan is beautiful and very clean and has everything a family needs. Owner left beautiful soft towels, hand wash, toilet rolls. I was impressed with full sized fridge freezer. It's a real home from home. I highly Recommend and will return. 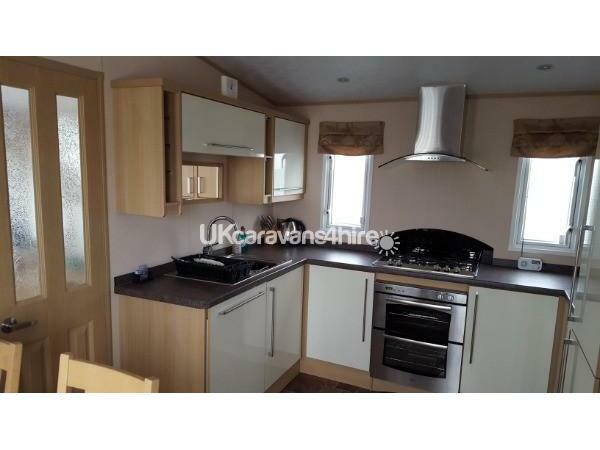 Beautiful, clean, very comfortable caravan with lovely views over the sea. Owner includes everthing from welcome pack with tea, coffee etc to lovely soft bath towels, toilet roll, and hand soap (which makes a massive difference to the amount of stuff you need to pack!) Really enjoyed our stay and will be back. Would highly recommend!! Lovely caravan kids loved it's plenty games etc for kids to play with caravan over looking the sea would definitely recommend it.